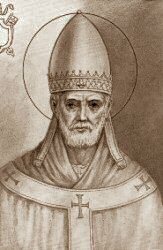 Information on St. Damasus and ideas for his feast day. Saint Damasus is most famous for commissioning Saint Jerome to translate the Scriptures into Latin, the Vulgate version of the Bible. The Latin Vulgate has become the standard for the Catholic Church, and the Council of Trent declared it to be "held authentic in public readings, disputations, sermons and exposition." It was the Scripture text used by the First and Second Vatican Councils. Many Catholics today don't even own a Bible, and if they do, rarely use it except as a family record. Sacred Scripture is Divine Revelation, the Word of God. The Catechism of the Catholic Church explains the significance of Divine Revelation. Are we treating Sacred Scripture with respect? Do we read the Word of God regularly? Perhaps today would be a good time to start a family program of reading the Bible regularly. You don't have to read book by book, straight through to the end. A good starting place is to read the Sunday Mass readings and discuss them, before or after Sunday Mass. When these are read in Church many times they are excerpts of passages. Read the whole passage and get a good Bible commentary to understand what the readings mean. The Navarre Bible is an excellent commentary that provides a deeper understanding of the literal and spiritual senses of the word of God.